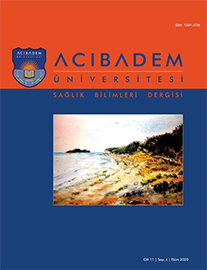 1Hacettepe Üniversitesi Hemşirelik Fakültesi, Ankara, Türkiye DOI : 10.31067/0.2018.66 Objective: Research was conducted as a methodological design with the aim of examining the validity and reliability of the multidimensional 5-D Itch Scale. Materials and Methods: Sample of this research consisted of patients with pruritus in hemodialysis centers of two university hospitals in Ankara. An adaptation of the validity and reliability study of 5-D Itch Scale was converted into the Turkish Language and was carried out with 100 patients. Frequency and descriptive statistics and Davis"s technique for constructing validity analysis were used. Results: According to findings: the Kaiser-Mayer-Olkin test result was found to be 0.678, Bartlett"s sphericity test result was found to be 0.000 and explained total variance for the 5-D Itch scale was found to be 70.284%at first stage. Cronbach"s Alpha reliability analysis results of the 5-D Itch Scale was found to be 0.608 and harmony between first test and re-test Inter-Class Correlation Coefficient- ICC was found to be 0.936.